This couple had their vineyard wedding at the Rose Bank Winery in Newton, PA. The grounds were absolutely gorgeous with many little nooks where we could explore and have different backdrops to their images. It was a freezing cold October day, but they rocked their portraits like champs. 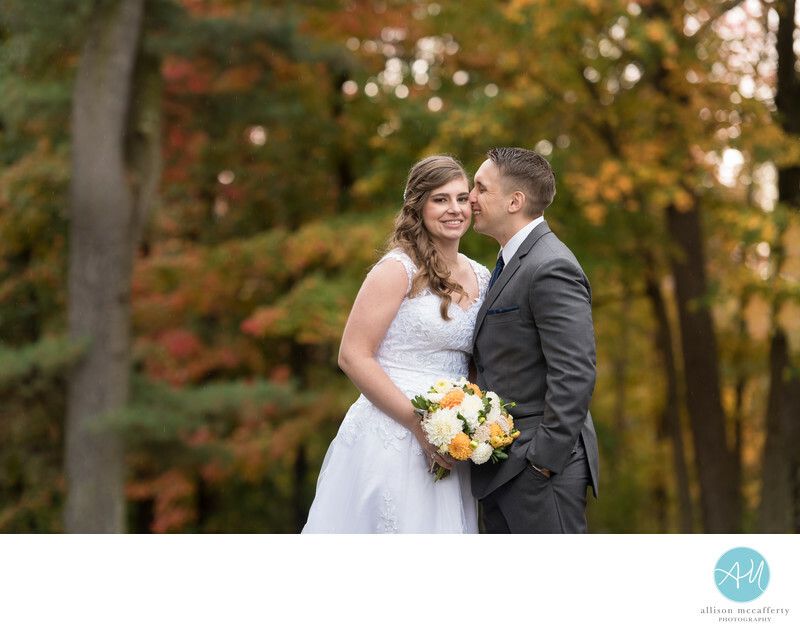 I wanted to make sure I captured their autumn wedding in a way to display the fall foliage and really give a feel for the day. I met the bride through our children's babysitter. She was planning a small wedding and wanted a photographer to capture the day as unobtrusively as possible. I love winery weddings so I was super happy to be a part of their wedding day. The bride and groom planned for a first look before their ceremony. The venue had a porch overlooking the grounds where they planned to do their first look portraits, so the bridal party stood outside to watch. One of my favorite photographs was when the groom saw his bride for the first time with the bridal party in the background. We didn't have enough time to do the bridal party photos before the ceremony, but were able do them after. The grounds at the Rose Bank Winery were perfect to explore and we were able to get some beautiful photos. Location: Rose Bank Winery, 258 Durham Rd, Newtown, PA 18940.